One presentation that clearly stands out is the pre-release tasting for a group of about 120 wine journalists, sommeliers, retailers, importers, etc from all over the world, but mainly from Germany, in the old Kurhaus in the stately German spa town of Wiesbaden, which is 45 minutes drive from Frankfurt. It is a seated, very well organized tasting where you have the chance to go through the Grosses Gewaechs wines during 2 full days. The invitations for this event are highly sought after. This year, I was happy to get invited and to participate in the event. Others I saw at the event were Jancis Robinson from the Financial Times, US wine importer Rudi Wiest and Gault Millau WeinGuide Deutschland editor Joel B. Payne. 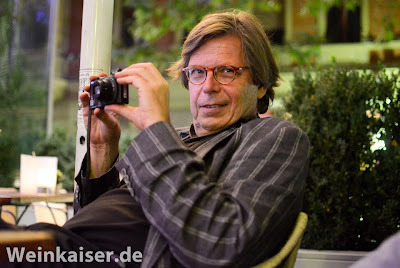 Ralf Kaiser – Weinkaiser – has put together a nice series of photos, which was reissued by the VDP. It also includes a picture of me (see above), taken during the evening event of the first day. See here for the photos: Weinkaiser's Photo Impressions.